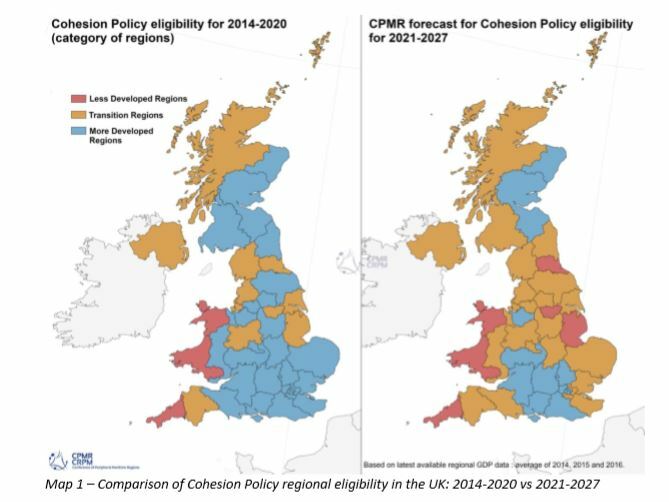 The CPMR has published a projection of the share of funding from the EU Cohesion policy for its member régions, including those within the UK. This work is based on the allocation methodology for ERDF and ESF for the post-2020 period published on 29 May 2018 by the European Commission (Annex XXII of the Common Provisions Regulation – CPR). The CPMR is a European organisation representing the interests of 160 regions from 25 countries from the European Union and beyond. The UK Members of the CPMR include the Welsh Government, several local authorities in Scotland, and Cornwall Council and Southend-on-Sea Borough Council in England. It carried out this exercise in the context of the uncertainty of Brexit, and it forms part of a broader body of work carried out by the CPMR on Cohesion Policy funding mechanisms to understand the impact of the negotiations for the benefits of its Members. Read the CPMR analysis to learn more.